Lately, my riding has focused on a lot of speed and climbing work. I have started participating in a local criterium to try to gain some racing experience and a temporary relocation to my in-law's place to house sit for them while they were away on travel means a lot of opportunity to focus on hills. 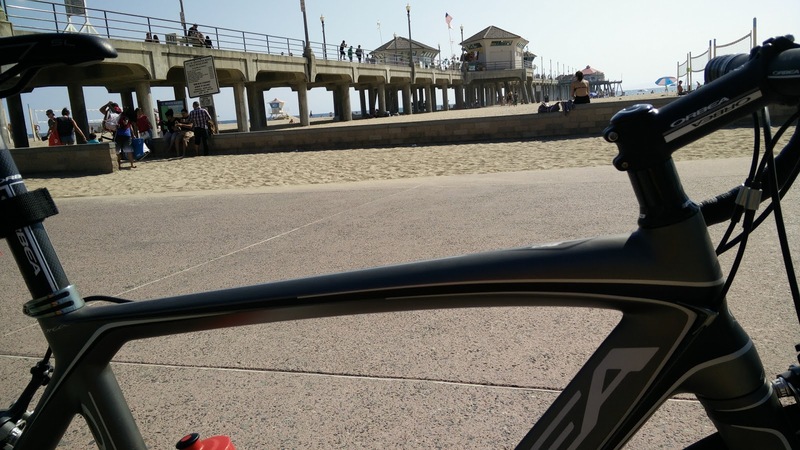 In the criterium, it is hard not to get equipment envy. There are a lot of people sporting some serious equipment and a few sponsored teams come out to use the ride as a part of their training regimen. The actual racing is not that exciting as the same handful of riders seem to always be in or near the top of the heap. 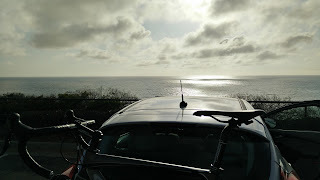 However, from an educational perspective, it is helpful to not only understand more about bunch start racing, but also better understand my body's limitations at the moment and the limitations of my equipment. On the equipment front, the Orca has proven slightly outmatched, although not necessarily because of the frame, but rather more because of the other hardware attached to the frame. Most people riding in this crit have clearly been doing it for a long while and are sporting aero wheels or, at the very least, much more expensive wheel sets than the Axioms that are on my bike. Still, since this was intended to be a learning experience for me, I do not feel the least bit concerned about where I place and am just happy to have the opportunity to take part. As for riding the hills, the Orca has both positives and negatives compared with the K2 that it replaced. If nothing else, the carbon fiber bike makes it significantly lighter. The complete bike weighs around 18.5 pounds, which is nearly 7 lbs lighter than the aluminum frame bike that it replaced. That makes going up even steep hills feel significantly less strenuous. However, the one drawback compared to that old aluminum frame bike is the fact that the K2 had a triple crank set and the Orca has a compact double. That extra set of gears, should not make that much of a difference, but there are definitely times when a few extra ratios would be helpful to have. Still, having pushed it hard the last few weeks on the hills, I am definitely able to appreciate the greater stiffness that carbon fiber offers and the smoother shifting of the Ultegra components. Hopefully there will be a lot more riding to be done this summer. Now that most of my time at is spent walking around town, the Shogun sees less and less use as a means of transportation. Of course, that doesn't make me appreciate it any less. It is still easily one of the most comfortable bikes I have ridden; the steel frame providing a subtlety to the ride quality that stiffer frames simply cannot match. These old vintage steel frame bikes truly are awesome city bikes. And because the components are a bit older, they are from a less complicated era making them much easier to clean and work on. Even something like the front tire, which I recently had to remove to replace a busted tube. That had to have been the easiest tire to remove and install. It was so much more compliant and the bead so much more pliable than the more modern tires on my other bikes. It took me only a matter of minutes to go from dropping the wheel out to placing it back in with a brand new tube installed. 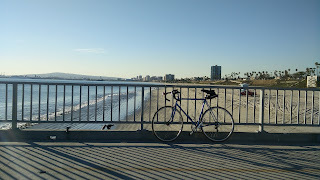 Unfortunately, I was not able to participate in Bike to Work week this year, in part because I work from home, but also because life has conspired to keep me rather preoccupied. Of course, if I had participated, I would have happily gone for a ride on this 30+ year old bike that has served me so well over the last dozen years I have owned it. It is still the one bike I will likely never replace. 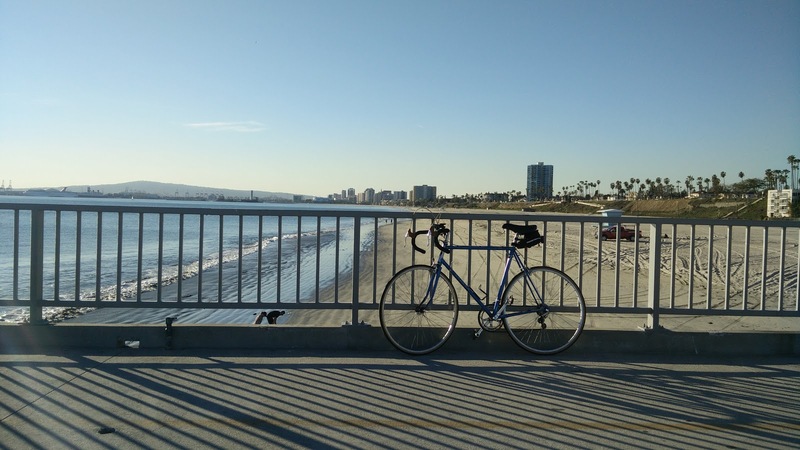 At the start of this National Bike Month, my wife and I participated in the American Diabetes Association's Tour de Cure Ship to Shore cycling event in the city of Long Beach. Kicking things off in the shadow of the Queen Mary, the longest route takes a circuitous path around the local area and totals up somewhere around 100 miles. As this was our first time doing the event, and the first charity event that my wife has ever ridden, we opted for a much more manageable 11 mile route. 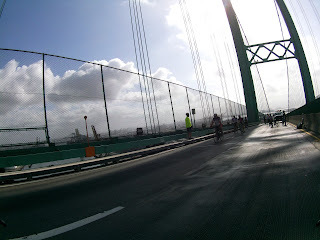 The important thing is that the route allowed us the opportunity to cross the Gerald Desmond and Vincent Thomas bridges. Ever since I had learned last year that there was a chance to do such a preposterous sounding thing, I knew I had to make it happen, even if just once. Of course, experiencing this also got me thinking about just how different, yet still the same our needs are with different modes of transportation.